Well, I couldn’t stop at Laundry Detergent, I had to keep going so I thought I’d try Dishwasher Detergent. Well, if I was honest, my mom gave me my first batch of dishwasher detergent. I really wanted to like it, but I didn’t. I tried to like it. I read on-line about how to make it work better. 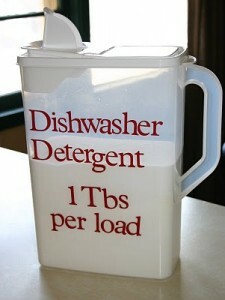 Websites suggested pouring white vinegar in the bottom of every load to help the detergent work better, so I did. I used all she gave me because I don’t like to waste but it wasn’t working for me. So, when I finished the batch my mom made, I decided to make my own. Surely, I could do better than my mom. Isn’t that what every teenage girl thinks? Oh, wait…I’m not a teenager. Well, I still thought maybe I could find a better recipe. So, I tried on my own. Here is the recipe I used. Lemi Shine rinse aid (this recipe does not work very well without it) You can find Lemi Shine in the dishwasher detergent isle at just about any store. You can also use vinegar as a rinse aid. If your dishes are coming out with spots on them that means you do need a rinse aid. Well, here’s the verdict: mine was no better than my mom’s. I’m not sure if she used this recipe but I don’t think so. So, here is my Pinterest review: I don’t like it and I’m sticking to my Cascade. It doesn’t really save money if I have to rewash the dishes and that’s what was happening. Question: Anybody tried a homemade dishwasher detergent you liked, that you thought worked? Leave a comment and share it with the other readers.